Trust us to manage your project from concept to completion. Our well qualified staff and company divisions in Design, Estimation, Plumbing, HVAC, Spray Foam and others will work your new building into an efficient, professional presentation of excellence. Already have a GC? Need simple/major repairs? Looking for upgrades to existing equipment? We look forward to assisting on your new projects as you improve your image and successes. Have an emergency slowing your company down or completely halting work? We are ready to get you back to proper efficiency. And our on-going service and maintenance programs can help to minimize future occurrences. 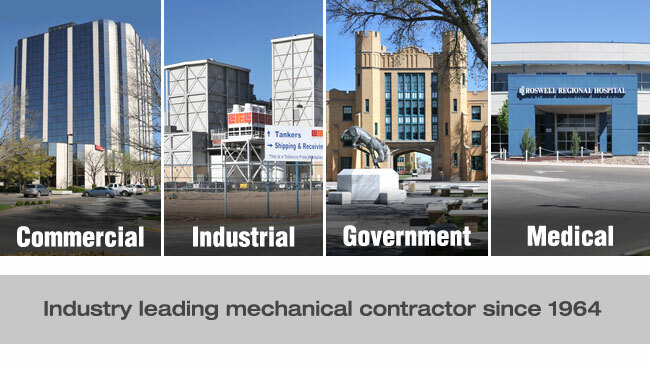 Since 1964, Rhoads CO has been establishing itself as the top-rated New Mexico Mechanical Contractor as well as the go-to expert for both Commercial Air Conditioning and Commercial Heating. Our reputation as industry leaders in HVAC Contracting, HVAC Installation and overall HVAC Service has been earned because we consistently satisfy our clients by meeting set schedules, hitting pre-determined budget points, and giving the best possible service. We are known for being consummate professionals who also understand what it means to be friendly, caring and enjoyable to work with. This combination of skill and personality is what has helped us form long-term client relationships and generate repeat commercial business across Roswell, Ruidoso, Hobbs, Carlsbad, Artesia, and the surrounding areas. As we expand our reach across all of New Mexico and beyond, we will hold tightly to what has made us trustworthy business partners. If you are looking for a company who will do everything to meet your commercial HVAC service needs, search no further than Rhoads CO. Our greatest asset is not tools or equipment but rather our skilled, trained and experienced team, which is dedicated to creating long-term good by doing the best work for you every single day.